For caregivers at Brooks Rehabilitation in Jacksonville, Fla., the “ah-ha moment” that bundled payments are moving healthcare quality and cost in the right direction comes when they look at the Brooks Care Compass. An electronic tracking tool, the compass helps Brooks' post-acute providers see a patient's experience from the hospital to a post-acute setting to home, said Michael Spigel, chief operating officer at Brooks. 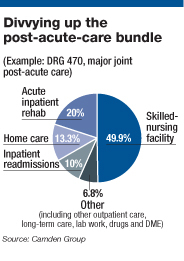 An early participant in Medicare's Bundled Payments for Care Improvement (BPCI) initiative, the post-acute care provider has seen positive results in both lower costs and fewer hospital readmissions for its patients. Spigel credited the program's early success—it was launched last October—to three essential components: care navigators, who manage a patient's entire episode of care and catch things “before they fall through the cracks”; analytical and IT tools that track a patient's vital, clinical and functional signs; and a cultural change across the system that requires Brooks caregivers to standardize assessments at the beginning and then repeat those assessments throughout the patient's entire episode of care. And it's that broader view of a patient's entire experience that captures the purpose behind bundled payments. Experts cite a host of reasons why a bundled- payment model for an episode of care is proving to be an effective weapon for improving quality and lowering costs. The structure aligns incentives among clinicians, providers and payers; it allows providers to track their patient's care after the patient leaves a hospital or doctor's office; and it produces results more quickly than other innovative payment structures, such as accountable care organizations. There is growing excitement among providers about the effectiveness of this payment structure, said Valinda Rutledge, a former nurse and hospital CEO who led the bundled-payment initiative at the Center for Medicare and Medicaid Innovation from June 2011 until July 2012. Now CEO of Rutledge Healthcare Consulting, she was recruited by Drs. Donald Berwick and Richard Gilfillan—then CMS administrator and CMMI director, respectively—after developing a 180-day bundled-payment program for Charlotte, N.C.-based CaroMont Health in conjunction with Blue Cross and Blue Shield of North Carolina. 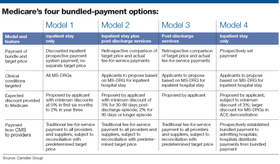 A year ago, the CMS' Innovation Center (a product of the 2010 Patient Protection and Affordable Care Act) announced that about 450 healthcare organizations nationwide would participate in the BPCI initiative, a program composed of four different models (See chart, p. 18) with varying payment and care structures that link payments for multiple services that Medicare beneficiaries receive during an entire episode of care. The idea is that a bundled-payment arrangement will lead to higher quality care for patients and lower costs for the Medicare program because it aligns incentives for physicians, hospitals, and post-acute providers to work collaboratively across all settings and specialties. Participants can choose from all hospital DRGs in the first model and from among 48 clinical episodes of care for models 2, 3 and 4. The BPCI has two phases for models 2-4, where participants use the first phase to prepare and the second phase to assume financial risk in the program. Last week, the CMS announced that 232 acute-care hospitals, skilled-nursing facilities, physician group practices, long-term acute-care hospitals and home health agencies have entered into agreements in the BPCI, including 19 hospitals, physician groups and post-acute providers that began the second phase for models 2, 3 and 4 last October, and 192 that started the second phase in January. Meanwhile, 21 awardees are testing bundled payments in model 1. Echoing Spigel's comments, Marion McGowan, executive vice president at Lancaster (Pa.) General Hospital and Dr. Paul Casale, chief of cardiology at Lancaster General and medical director of quality at Lancaster General Health, say standard protocols are essential in making bundled payment programs effective. Lancaster began participating in model 4 in January, and McGowan explained that aligning clinicians and hospitals to set standards—even on something such as which implant to use—helps clinicians anticipate which steps to take to reduce a patient's length of stay. Lancaster General also implemented tracking tools to monitor the program's approximately 50 patients while they're in the hospital and after they leave. Similar to Brooks Rehabilitation, it uses care coordinators or navigators (primarily nurses) to work with patients to ensure their care is well-coordinated, Casale said. Meanwhile, Amedisys—a Baton Rouge, La.-based company that provides home health and hospice services to approximately 380,000 people each year through about 450 care centers—is starting to see positive results in part of its pilot. About 30 care centers in Kentucky and South Carolina went live with bundled payments in January, and another 30 sites will launch in Indiana, Louisiana, Mississippi and Tennessee in April, according to Julie Lewis Sutherland, vice president of research and development.“For one of our regions that went live Jan. 1, we've actually seen a 21% absolute decline in the 90-day readmission rate, so that is absolutely on target on what we want to see,” she said. Some other areas are “holding steady,” so Amedisys is trying to learn what worked well in one area and apply that to other regions. As providers show early signs of success, they're doing so in an environment that is more receptive to bundled payments, said Mark Hiller, vice president at Premier Performance Partners, the consulting arm of Premier healthcare alliance. Six of Premier's members are participating in the CMMI bundled-payments pilot. This new environment is partly attributable to the Medicare Payment Advisory Commission's recommendation to add more bundles through Medicare, and also because lawmakers have taken notice on Capitol Hill, Hiller said. In December, Reps. Diane Black (R-Tenn.) and Richard Neal (D-Mass.) introduced the Comprehensive Care Payment Innovation Act to create a voluntary bundled-payment program for Medicare. Participating providers in this model would receive one lump sum payment to cover the cost of a patient's hospitalization and the first 90 days of post-acute care. The federal program also builds on successful efforts in the states, which often relied on commercial payers managing their state Medicaid programs. In 2011, Arkansas Blue Cross and Blue Shield partnered with Arkansas Medicaid, the Arkansas Department of Human Services and QualChoice of Arkansas to create a bundled-payment program that launched last year, said Kimberly Hartsfield, now at the Camden Group after spending 20 years with Arkansas Blue Cross and Blue Shield. The insurer also uses a bundled-payment model with Wal-Mart Stores, the nation's largest employer that uses the BCBS affiliate to manage its self-insurance program. “The intent was to develop a program to more effectively use existing dollars and reduce costs related to duplicated tests, unnecessary procedures and poor coordination of services,” Hartsfield said. She added that bundled payments provide a better introduction to payment reduction and risk-sharing for providers than ACOs because they offer a better picture of what happens once patients leave the hospital. “Bundled payments are providing an opportunity to align the financial elements appropriately, providing quality and patient-centered care,” she said. There's general agreement that bundled-payment programs will continue to spread among both public and private payers. The Camden Group's Baggot predicts a shift to more outpatient bundles, particularly for elective outpatient cardiology, orthopedics and spine procedures. Rutledge, the former CMMI official, said this pattern mirrors the shift in healthcare from inpatient to outpatient services, and she expects to see movement with bundled payments in the outpatient setting in the next 12 to 18 months within the healthcare industry as a whole. One area to watch is oncology, where costs are rising rapidly and 75% to 80% of the care for the 1.4 million new diagnoses each year is handled in outpatient settings, according to Ajay Gupta, a former senior adviser to the CMS who is now COO at Integrated Oncology Network in Corona del Mar, Calif.